1. 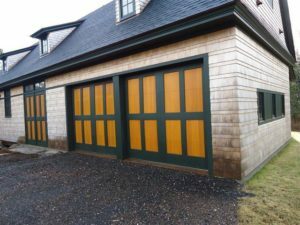 Carriage House Garage Doors: A century ago, the carriage house served as the garage for affluent families who owned their own horse and buggies. While the doors to these storage houses were once side-hinged and swung out to open, the current trend of housing automobiles in carriage houses has eliminated the swinging door. In today’s world, garage door manufacturers conjure the carriage house appearance with a door that opens from the ground up and comes in a variety of custom colors, trim, and windows. Choose carriage house style for a classic look that best suits homes with an old-world character. 2. Contemporary Garage Doors: Looking for a more modern style? Choose a garage door that makes a statement. Crafted from aluminum, glass, wood, or even metals like steel, copper, or zinc for a sleek, cutting edge appearance. These elements combine for a current look perfect for housing your vehicle in style. 3. Raised Panel Garage Doors: A staple in classic American design, the raised panel garage door offers you reliable construction with timeless appeal. Looking for a little customization? Flex your design muscles with wood versions and windows placed to enhance this door’s aesthetic appeal. Want more color? Wood can be painted or stained to suit your preferences. Raised panel garage doors also come in fiberglass or composite materials that resist dents and offer paint-ready textures for a look that’s all your own. When designing your home’s exterior, do you consider your garage door an essential piece of your aesthetic picture? With many structural options and even more material and paint choices available, you have every reason to do so. Get in touch with your creative side and consult your trusted garage door installation company to help bring your vision to life.